Join Alberta Ballet for the highly-anticipated return of the portrait ballet that 10 years ago started it all. 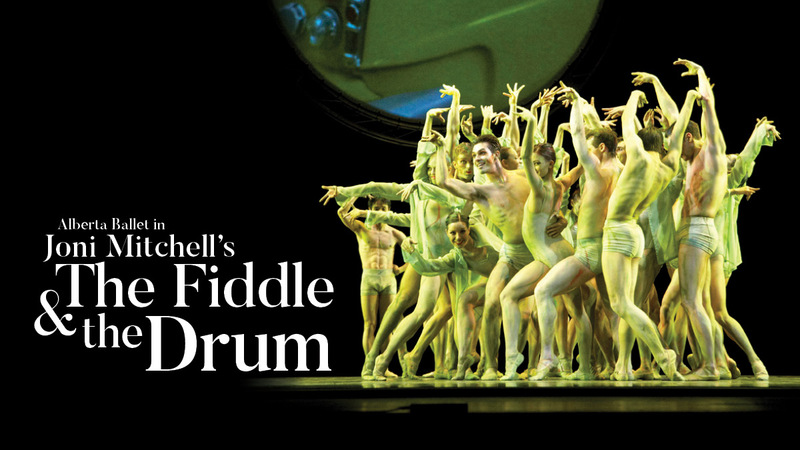 Joni Mitchell’s The Fiddle and The Drum was the culmination of a two-year labour of love that catapulted Alberta Ballet into the international spotlight. The renowned production is returning to Canadian stages for a limited time in May 2019 in commemoration of its 10th anniversary. 1. The Fiddle and The Drum was born from two years of working alongside Alberta Ballet impresario Jean Grand-Maitre, sparking a deep friendship between him and Joni Mitchell, which continues to this day. 2. Joni Mitchell herself desired to be involved in everything – from the choreography, to the set design, to the costumes, and of course song selection. 3. As such, the production includes three Joni Mitchell originals exclusive to the ballet’s soundtrack. 4. The production was created in celebration of Alberta Ballet’s 40th anniversary. Grand-Maitre initially intended on choreographing to Beethoven until a friend suggested Joni Mitchell as an alternate source of inspiration. 5. The ballet’s score covers four decades of Mitchell’s work, but is not biographical – the production’s numbers cover universal themes of conflict, humanity, and the environment through the lens of Mitchell’s music, and the characters portrayed in her unforgettable array of songs. 6. The Fiddle and The Drum is a portrait ballet production – focusing on one artist’s musical body of work – and it was the first of it’s kind for Alberta Ballet. The company has gone onto produce other portraits centered on artists like Elton John, The Tragically Hip, Sarah McLachlan, and more. 8. Three iconic Alberta Ballet dancers were featured in the original production: Mariko Kondo, Reilly McKinlay, and Kelley McKinlay – and will all be performing again for this special run of the show! Once more, witness Joni Mitchell’s legendary songs come to life on stage through movement executed by the powerful troupe of 30 Alberta Ballet Company dancers. Purchase tickets to The Fiddle and The Drum here for Calgary, here for Edmonton, or in the widget below.